A few weeks ago I was contacted by the great people over at Solo Foods to enter their Sweetest 16 Baking Recipe Contest. They sent me a box chock full of almond paste and several of their pastry and pie fillings and asked me to come up with an original recipe. I pondered over this for a while before I began to bake. I wanted to make something different and not the typical macaroon or almond cake. I almost entered my recipe for The King of Cakes: Baumkuchen but decided to think a bit outside of the box. I decided on two recipes, one being this one and the other being a take on a cinnamon roll but made with cardamom. The cardamom roll recipe was yeast-based and although was good, it was a bit too savory. It just didn't have that cinnabon-eque quality that I hoped it would so I've decided to table that recipe for now and revisit it. I thought of this recipe because a few years ago a neighbor gave me a tin of "cookies" covered in white chocolate. They were Ritz crackers filled with peanut butter and dipped in white chocolate bark and I was immediately smitten! I couldn't believe how good they tasted and have always had them in the back of my mind since then; it was one recipe I really wanted to try for myself. In the interest of keeping it simple and maximizing on yield, I decided to give it a go but replacing the peanut-butter with the almond paste (that I mixed with a little butter) and adding a skosh of apricot filling for a little something extra. I love the mixture of those flavors in the Baumkuchen so I knew it had to taste good. I brought in a test batch to my co-workers and although skeptical initially, but everyone loved them. Several of them said it tasted like a fancy Butterfinger and just about everyone couldn't believe I used Ritz crackers to make them. So if you're looking for a recipe that will yield a lot of cookies without having to spend much money or turn on the oven, these are your new best friend. Mix the almond paste and the butter together until well mixed. Take a cracker, flat side down and spread a very small amount of almond paste on the surface, just enough to fill in the holes on the cracker’s surface. Repeat with all the crackers for a more pronounced almond flavor or skip this step. Top one of the crackers with a small amount of apricot jam, just so it covers the center (about the size of a dime). Top with a second cracker, flat side up. Continue following these steps until you’ve used all the crackers. Melt the chocolate chips and the butter together (either in the microwave or over low heat in a sauce pan) and mix until smooth. 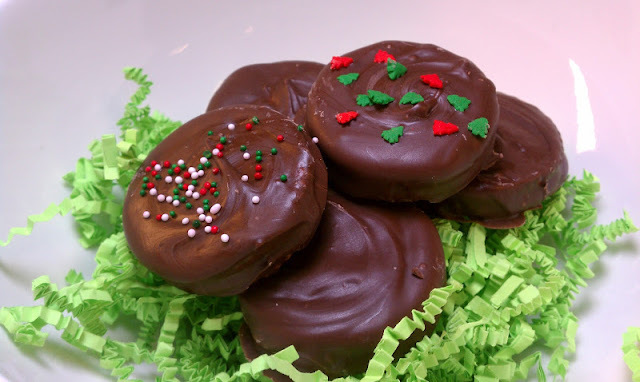 Using a folk or a small pair of tongs, dip the cracker sandwich into the melted chocolate and cover completely. Shake off the excess chocolate and place onto waxed paper and immediately decorate with sprinkles of your choice or just leave them bare. Let them sit until the chocolate is set. Keep cold or cool. Note about the yield: One 7 oz can of almond paste is enough to literally make at least a few hundred cookies (seriously!). It all really depends on how much you put on each cracker. I used a very thin layer of both the almond paste and the apricot filling. If you want to make a really big batch of cookies you will need to purchase more crackers, just keep that in mind. I tried one of these cookies and they were so good! The crackers absorb the filling and are super flaky. I would have never thought a cracker could make such a great treat. Yum!!! These are great. I wanted to eat them all but Julia wouldn't let me.